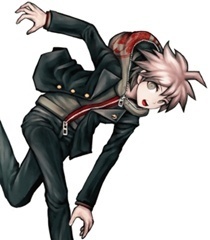 Introduce yourself as Naegi, or if the song you're singing has spoken parts in it that works as well. Are you sure you arent telling me just because I dont have your trust? Then promise me something. If at any point you think it will become dangerous, just let it go. Hold it! You've got that wrong, let me explain! C-calm down! I don't really know.. but it seems to be due to some sort of illness, but I wasn't really paying too much attention... since I'm not good at talking to people. Thank you Ikusaba-san. Thank you so much! We can't just give in to despair! I-I swear it was an accident! I didn't mean to do that, really! I'm not a pervert!